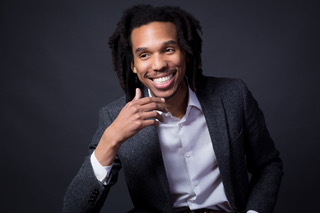 Joseph Monroe Webb is an international award winning dancer, choreographer, actor, educator and poet who has showcased his talents in a number of performances throughout the years, including the Tony Award winning Broadway production, Bring in‘Da Noise Bring in ‘Da Funk. Following his Broadway success, Webb ventured into acting in television and film, including Martin Scorsese’s film Bringing Out The Dead, Black Nativity starring Angela Basset and Forest Whitaker, a short film by Red Bull Academy Music NYC, and more. He has also performed on The Tonight Show with Jay Leno, The Opr ah Winfrey Show, and Live with Regis and Kathy Lee. Joseph was recently cast as a principal in a short Morningstar Farms documentary, released May 2016. On September 11, 2016, Joseph completed a six-week run of Tony Award winning Broadway musical Jelly’s Last Jam at the Signature Theatre to critical acclaim. Joseph has appeared as a feature and/or starring act in the cast of the Thank You Gregory, Tap Stars (Hamburg, Germany), Cotton Club Parade with Wynton Marsalis, and more. Joseph received raves reviews for his first major work at University Settlement, with the NY Times citing Joseph and his ability to blend various genres of art into one show as,“too hard to categorize, but there is no doubt he is a natural star.” In March 2016,Joseph returned to University Settlement (NYC) to debut the premiere of his latest work, Dancing Buddhas: The Three Jewels, to a sold out audience. Joseph is excited to continue developing part II and III of this dance-theatre series with the Dancing Buddhas professional dance company. When he is not onstage, Joseph choreographs for various dance organizations, including his pre-professional youth tap company, House of Tap. Joseph is the founder and director of American Embassy of Dance, a dance school specializing in percussive dance in Washington, DC.